Great care must be used in interpreting the likes of cortisol levels when trying to measure stress in horses, especially if they are not carefully related to behavioural observations, according to researchers. Cortisol levels, average heart rate and heart-rate variability are physiological measures used in many studies to assess the level of stress, emotional response and pain in horses. They are used by scientists to make comparisons between handling/training regimes, housing, transport conditions and even veterinary treatments. But Dutch researcher Kathalijne Visser, of the consultancy Horsonality, and Camie Heleski, of Michigan State University, sounded a note of caution in using such parameters during a presentation at the recent International Society for Equitation Science conference in Denmark. The pair said cortisol levels have been measured in either saliva, blood or feaces in many equine studies. Typically, researchers interpret the data as higher cortisol levels indicating a higher level of stress. Was that always the case, they asked? They said cortisol tests were reasonably inexpensive, but interpreting the results could be challenging. The pair said care must be taken to standardize the time of data collection due to naturally occurring patterns in levels during the day. They said physiological measures of pain, distress, frustration and emotionality can often contribute to scientists’ understanding of a horse’s emotional state and potentially its welfare status. “However, tremendous care must be used in interpreting physiological measures, especially if not carefully related to behavioural observations,” they said. The conference, which attracted 235 delegates from 22 countries, focused on the measurement and interpretation of stress responses in horses. Conference organisers said the main message was that, in order to assess stress in horses, studies must be carefully planned and conducted under standardised and controlled conditions. They must use validated methods and take indicators such as behavioural observations into account. Equestrians were reminded that, besides the physical impact of stressors, perception (for example, inherent fearfulness), life history and early experience were also key contributory factors to the stress experienced by horses. Links between stress and brain function, including effects of the neurotransmitter dopamine, were emphasized. “Dopamine is heavily involved in the reward system and in memory formation and learning in horses. 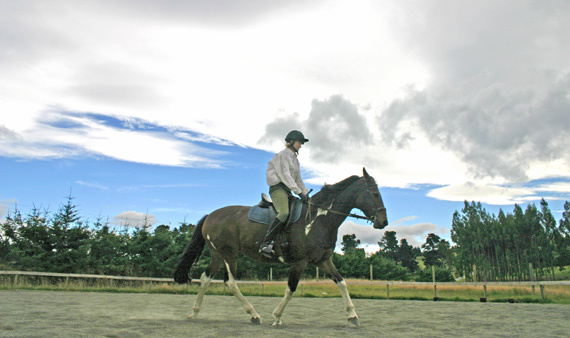 “There is no doubt that research in neuroscience and brain function will bring new insights to the importance of how horses learn optimally in practice,” the conference organisers said.